I decided to do Project 365 since it’s the start of the (Chinese) New Year. For those that don’t know what that is, it’s a project in where you take ONE picture (or two or five thousand) a day as a reminder of life. I’ve been writing in a calendar something good per day but this seems more memorable since it’s in the blog and all. I don’t know if I’ll post every day or not. BUT I will take a picture everyday and try my best to post it everyday. If not then I’ll just pretend I posted it that day … when we all know I didn’t. Lies. I know. Happy Chinese New Year, wonderfuls! It’s been a very relaxing weekend hanging out with the family. The members in our family dwindles down every year since we’re all so busy with work or school and such. But when we get together, it feels like old times. Given the only kids this time around was sissy, Brett, and I, we still had fun. Since it’s the year of the snake, my year, it means I have bad luck. 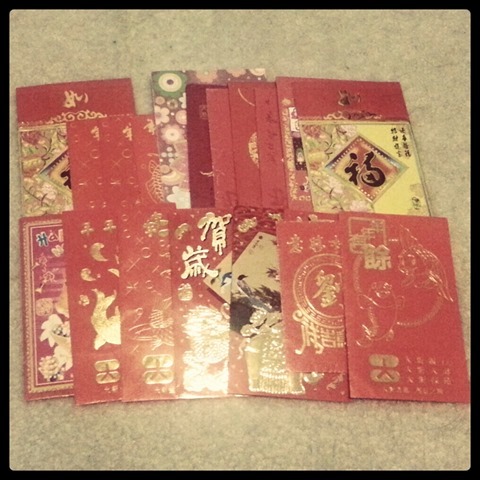 Therefore Mum, Dad, and June gave me an extra red envelope. Two of which has red string in it and I can’t use the money in it for a year. Used to ward off the bad. The other red string is tied around my wrist. Hope it works. I need all the good luck I can get. If you’re a snake, like me, it means you’ll have bad luck this year. Eeps. Last night’s dinner to celebrate the end of the year and the start of the new one. Eight dishes equals good luck or something. I’ll be busy doing things Chinese people do on this day. Valentine’s Day is coming up … who wants to be my date? Yesterday was my brother’s last day being in town. We went and ate lunch at Longhorn Steakhouse – recap on the food on a later post! Then we went home and just chilled a bit before he had to leave. I then met up with some FTKers and we went to another FTKer’s house to film a video! We will show you the video when it’s done. It’ll be epic. … I hate that word but it works. And finally! It’s Chinese New Year! Year of the Dragon! It’s going to be a long day for me but I hope it will be a good day. I hope you have a blessed Monday! So it just turned 12AM! It’s Chinese New Year. Sadly the roads might be icy and snow might fall and since we live in a hot zone, or so we thought, we are not use to driving on a road with such distraction. Therefore my family is saying I should stay put where I am. It’ll be the first year not being home for Chinese New Year. So if we think about it, I didn’t break my new year resolution? Maybe? Just kidding.